The Harry-Potterization of Photos: What It Means for Social Media Marketeers - Harold Tor. When the moving portraits in the Harry Potter movies appeared, people instantly said this would be the future of photos. No more stagnant, one-dimensional pictures that do not portray the character of the person captured. And now, the time has arrived! It all moved very quickly. “Vine” by Twitter: Vine was founded in June 2012 and was acquired by Twitter in October 2012. It was launched this January for the iPhone/iPod and in June for Android. Within this period, it became the most used video-sharing application in the market, and in April the number one most downloaded free app within the iOS App Store. Vine allows the user to take short six seconds video and you can tag each video with hashtags to make them searchable for other users. There is a menu that consists of: Home, Explore, Activity, Profile. The Home section shows you the Editors’ Pick, a great move because the videos are really well-made and inspirational – gives you that extra kick to take great videos. The Explore section cleverly shows you graphic tiles of popular hashtages like selfie and cute, while the list of trending hashtags is displayed below. To take a video, you can slide your finger across the screen and remove to pause. The effect is a stop-motion-like artsy video that truly mirrors the portraits in the Harry Potter movies. “Instagram videos” by Facebook: Created in 2010, Instagram was acquired by Facebook in April 2012. The video capture functionality which debuted on the 20th this month constitutes the single most significant change that happened since the Facebook takeover. The maximum video length is 15 seconds. Lodged within the Instagram app, the user now sees a camera button to activate the function. To take a video, it suffices to long-press on the red button and remove to pause. 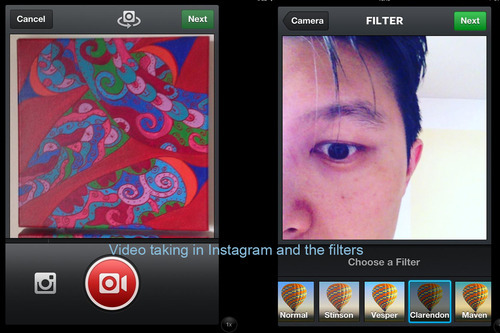 Familiar to their 130 million monthly users, Instagram video comes with the usual range of filters. On top of that, one can watch the videos not only in the app itself but also on the Instagram site. What’s in it for social media marketeer? According to this Adweek article, brands like Burberry and Lululemon are already using Instagram video. 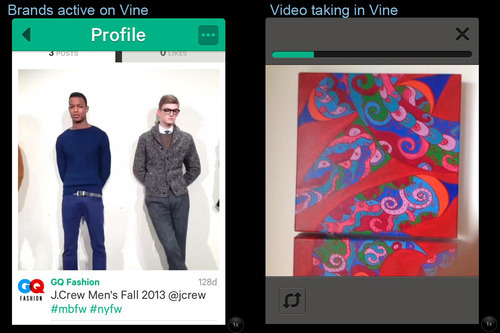 A quick look in Vine reveals that some fashion brands are active too. Looking at the user base of both apps, the audiences are mostly young, trendy, alternative, creative individuals, so consumer products like clothing, shoes, bags, makeup, accessories, food, personal electronic products will be the first ones to enter the game. As the user base expands, other B2C businesses could look at these apps as a channel of brand marketing or quick ads for an event. The possibilities are abundant, you just have to be creative. 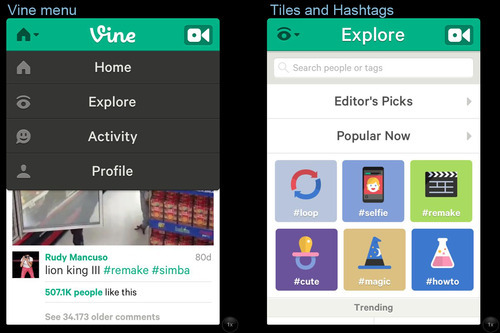 In terms of which app to use, Vine has had HUGE success in the past few months. Their 13 million users are producers and consumers of the videos. While Instagram just entered the game yesterday, their 130 million monthly photo users constitute a huge potential, but how many of those will divert to taking pictures as well? On the other hand, Instagram video is longer – hence allows more room for creativity and content – and the filters create an artsy hipster effect. Vine videos have been extremely creative because the shorter maximum length forces users to come up with really innovative short bursts of video. 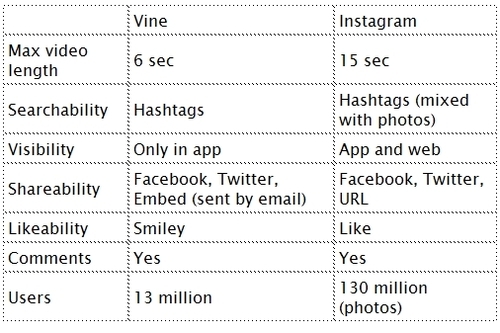 The comparison between Vine, Instagram video and Youtube can be likened to Twitter, Facebook update and Email. The crucial point for social media marketeers is the Shareability and Searchability of their content. Facebook and Twitter shares are standard, but Instagram’s URL share is a game-winner. That being said, in view of the competition, Vine vows to come up with an improved version soon. All mashed in one app, the negative aspect of Instagram is that the videos are being mixed with the photos, and that makes the video searchability slightly more arduous compared to Vine.